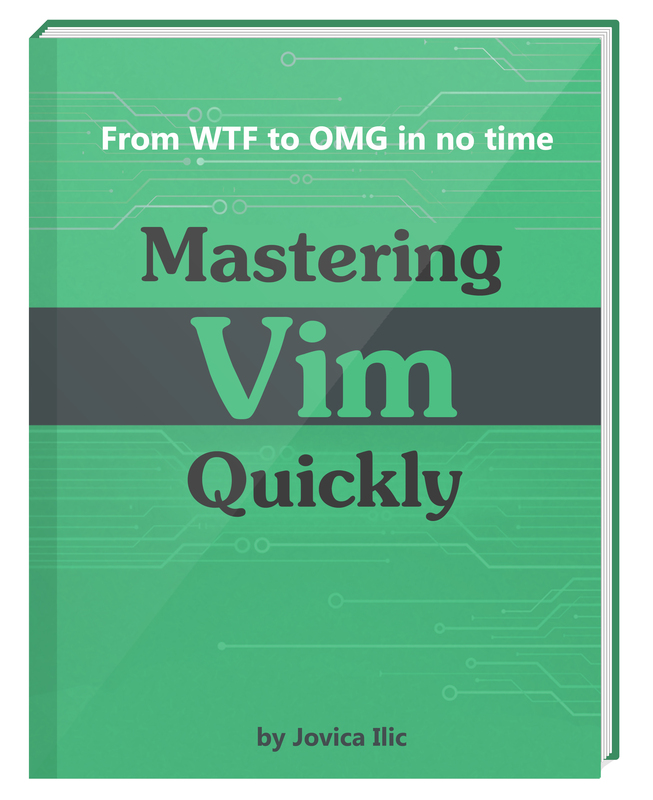 I wrote a book, on Vim, called: Mastering Vim Quickly: From WTF to OMG in no time. I want to tell you a bit about it. ## what kind of title is that, are you serious? ## why another book on Vim, for God’s sake? There was no really a good book on Vim. Not for me. Just like You are, I’m very busy too. I don’t wanna spend days on reading 300 page long books on Vim. I don’t need to know 1000 different ways do X in Vim, one or two is enough! I don’t want MORE information. I want LESS information, but I want the RESULTS. “I really like the material, found you on Twitter and quickly decided to buy the book and all the extras. I am already fairly experienced with Vim, but I realize I don’t know many of the basics, and I use too many plugins… for now it’s the best I have found, as I can immediately get value out of it without having to read hundreds of pages. I “felt in love” with Vim just about a year ago. Read a lot of manuals and books… or saying more precisely – tried to read. “Full&over”-time job and family are leaving no time for learning. ## okay, so how’s your book different? 1. I’m a learning addict, so I know A LOT about learning and our psychology. While learning any skill, there is a period of time in which you’re horribly unskilled, and you’re painfully aware of that fact. The same applies when learning Vim. But there’s a simple way to overcome this. The biggest obstacle you will face in your quest to learn Vim is yourself. Once you’re aware of it, even Vim becomes easy. One of the beautiful things about learning Vim is the fact that you don’t need to know everything. You only need to understand a few critically important concepts that provide most of the value. If you invest the time and energy necessary to learn these concepts, you’ll easily be in the top 1% of the human population when it comes to productivity in coding/programming/text editing. Over the years I’ve collected, distilled and refined my findings on Vim into the concepts and best tips which are presented in Mastering Vim Quickly. Think of this book as a filter. Instead of trying to absorb all of the Vim knowledge—and there’s really a lot out there—use this book to get what matters the most. PLUS: Screencasts you can get cover most important examples from the book, step by step. Each of them is only 1-3 minutes long, and without sound. This means you can listen to music while learning Vim! See one of them below. ## what’s inside, what do I exactly get? ## can I see some sample chapters and table of contents? Sure! 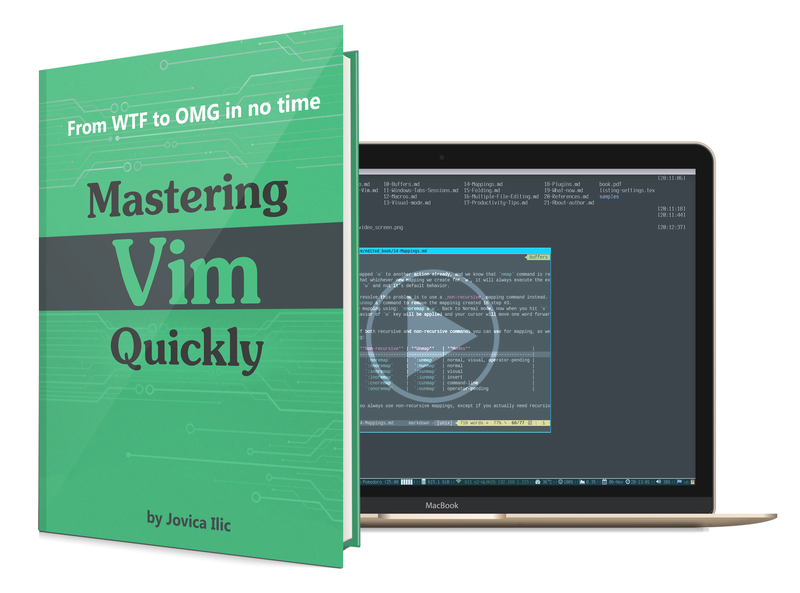 I can send you ToC + 4 chapters from Mastering Vim Quickly and bonuses, free of charge. ## I’m a Vim beginner, is this a good book for me? Of course it is. Warning: you might become advanced in Vim very quickly! “What prevented me from buying “Mastering Vim Quickly” was the fear of learning a new skill. But now I’m very happy and proud to, finally, have a book that concerns one of the fastest, ugly-to-most-users, text editor. I really liked the personalizing vim, the plugins, the folding and the search and replace parts. I loved the way that the content is spread across the book. I mean that it’s half a tutorial and half a vim-thesaurus. It does not tell you everything. I you want to find out more, you have to search for it explicitly. I do recommend this book because it’s a batteries-included book about Vim. No more, no less. I would really like this book to be sold in hard copy as well. :)” – Nick M.
## I’m experienced Vim user, will I learn something new? ## What can I actually learn? The power of Visual modes, argdo, bufdo, etc. ## what about those screencast, may I see one? you tried to learn but struggled to make progress. you’re intimidated by how difficult Vim appears to be. are experienced IT engineer who wants to quickly switch to Vim. are already a skilled Vim user, but you want to improve. don’t want to spend a lot of time on learning Vim. It is a great book packed with lots of productivity tips. By the end you will never want (or need) to exit the vim text editor. @jovica Thank you for taking the time to write @MasteringVim I’ve been a casual vim user for a year-ish but this is exactly what I needed to commit to getting better with it. ? your approach to learning vim and learning in general. ? ??? Finally, one I knew of! I consider myself pretty experienced with vim, still, I learn something new every time I open your book. Glad to support your work, keep it up! Someone who cares about me a lot, gave me the @MasteringVim book… Not only I hype but inmediately I just started to read, now I can’t count how many times I said “OMG”… And I read just first 30 pages, I can’t stop! Thanks @jovica for such amazing book! This tip was adapted from @MasteringVim, an awesome book by @jovica ??. You should check it and subscribe for free chapters on your email! Free updates to the current (first) edition of Mastering Vim Quickly book. What content is included in the screencasts that’s not included in the book? The book includes all of the content presented in screencasts. Screencasts do not cover every single chapter nor every single example. They are created to cover the most important Vim features and concepts, and meant to be used together with the book. This is the first edition of Mastering Vim Quickly. It’s going to be a long term project. The plan is to update the book (and other materials) once a year. Current version (v1.1) is published on April 2018, 5 months after the first publication. No matter how much I tried, I’m sure there are still some typos and errors left in there. If you find one, let me know please! My main goal with this project is to help You learn Vim. I don’t want to sell Mastering Vim Quickly to people who don’t want to commit to anything. I want people who are committed to results, to buy my book. Because I strongly believe: until someone is committed, information is just a waste of time. That’s why, there are no refunds. By not allowing a refund I can be sure you actually will read Mastering Vim Quickly. And you will probably read it with much greater attention, so you can absorb all the precious stuff you have in there. I know that if you have NO CHOICE but to make this work–and take the maximum out of this book, you will learn Vim. The author of Mastering Vim Quickly is Jovica Ilic. Sysadmin. Fan of Vim and Gentoo.